Tens of thousands of Oculus Touch controllers were shipped with unsettling unintentional easter eggs. Last Thursday, Oculus co-founder Nate Mitchell revealed via Twitter that thousands of the VR tracking controllers were accidentally released with inside jokes printed on an internal cable. “Unfortunately, some “easter egg” labels meant for prototypes accidentally made it onto the internal hardware for tens of thousands of Touch controllers,” said Mitchell. 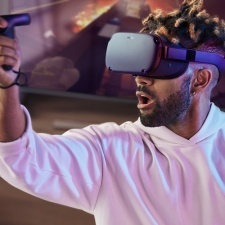 Business Insider reports that the affected controllers will ship with upcoming Oculus Quest and Rift S headsets and that there are no plans to recall the vandalised pads. Easter eggs are everywhere in tech and gaming, and it’s not exactly uncommon to inject a little humour into early prototypes. But Facebook is in near-constant hot water with privacy concerns these days, and it’s unlikely any consumer cracking open their Touch is going to be in on the joke. Oculus' Mitchell and VP AR/VR Jason Rubin insisted to PCGamesInsider.biz at GDC that Facebook's 2018 PR disaster hadn't impacted the virtual reality firm's business.